Wednesday, April 4, 2018 ~ 11:30 a.m.
Patricia A. Reisen, 81 of Ashland, NE, died Friday, March 30, 2018 at the Ashland Care Center in Ashland, NE. She was born July 2, 1936 in Omaha, NE to William and Helen Riley. Pat graduated from Omaha Tech High School. Through the years she worked for National Account Systems, Pacesetter and Mahoney State Park. 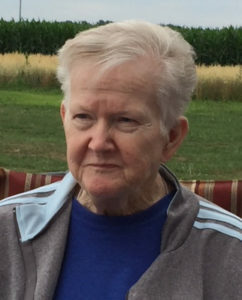 Pat enjoyed spending time with family, gardening and playing Keno. She is survived by sons, John (Connie) Coburn of Eagan, MN, Bill (Ruth) Coburn of Punta Gorda, FL and David (Lisa) Reisen of Ashland, NE; grandchildren, Jeff Coburn, Jenny Coburn, Ashley Williamson, Megan Reisen and Zach Reisen; great-grandchildren, Kalyssa Fox and Charlie Williamson; brother, Robert Pandis of Marietta, GA.
She was preceded in death by her mother and father; sister, Gloria Spittler; and special friend, Carl Taylor. Sorry for your loss. She will be missed by all that knew her. She seemed to always have a smile on her face whenever i saw her out and about in town.